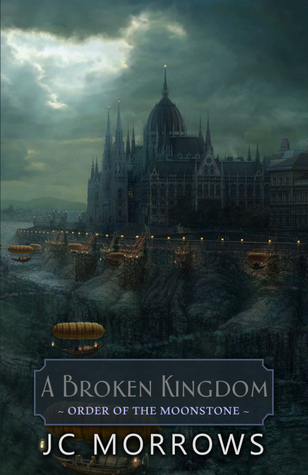 Today I am reviewing A Broken Kingdom, the 5th–and FINAL–novel in the Order of the MoonStone series, by the awesome JC Morrows. Which led to A Desperate Escape. Leads to A Broken Kingdom. When she fell in love with her target, Kayden realized she could not fulfill her mission. A Broken Kingdom by JC Morrows… will Kayden rule as Queen? Don’t miss this action-packed sequel! – Tweet this! Wow! I was NOT expecting so much! So many twists and turns! So many surprises!!! It really is the perfect sequel to the series! If you’ve been reading the Order of the MoonStone stories, I’m sure you’ll agree with me. JC Morrows is an amazing author/storyteller. I don’t normally like cliff-hangers. Most likely, not many readers do. But once I had read A Reluctant Assassin, I was hooked. I had to keep reading each sequel–and each sequel ended abruptly, making me squirm until the next story was available. The last story ended on another cliff-hanger! A heart-wrenching ending. This story begins with Kayden… lost, alone, struggling to live up to Dvarius’ expectations. But the love of her life is gone. Honestly, I can’t say much about this story without giving away something. It seemed like each chapter brought new surprises! Unexpected twists and turns around each corner! Do yourself a favor and get the whole series–five novels and five short stories–and read them in order. It doesn’t matter if you choose paperback or digital copies, just read them. And hey, while you’re at it, if you enjoy them, please take a minute and write a review on Amazon. A sentence or two will do–even a few thoughtful words is enough. It’s a wonderful way to let the author know you like her books–and it’s a great way to let other readers know that these are books worth reading. In my to read stack! Now.. I think I need to move it to the top!! Great review, Donna! I’ve been wanting to read this series!